I was on Missouri Highway 15 northbound on my way to work at the courthouse in Memphis, Missouri. As I approached the stop sign at the Highway 136 junction, I looked to my right and saw an approaching pickup truck. I don’t know the make and model for sure, but it was a large one, the same size as our Ford F150. I was, of course, driving my Pontiac Vibe. Right into the grille of the black pickup. The image is frozen in my mind. It was so sudden that I couldn’t even tell if it was moving or not. I was nearly stopped, not more than 5 MPH (probably less, I was really almost stopped) but the truck was, in fact, moving. It hit me head on. The next thing I remember is perhaps a second later. I don’t remember the moment of impact, but I’ve been in one or another kind of accident before and I never do remember that moment. But now the air was full of the smell of the explosive that deploys the airbags, and all of them were (except the passenger airbag, which the manual says does not deploy if there is no passenger in the seat). The truck was visible, sort of, through my shattered windshield, and my car was rolling slowly backward. I stopped the car, then took a quick inventory of myself. My left hand had blood on it, apparently from hitting the windshield; my right hand seemed okay, though later I would discover I had banged up my ring and pinky fingers. My left collarbone hurt, as did the right side of my chest and the left side of my upper abdomen; two bruises and a strained muscle, respectively. And the wind had been knocked out of me. As soon as my breathing was more or less okay, I called 911, and evidently explained the situation well enough; the nice lady on the phone contacted the Scotland County Sheriff’s Office, and then told me they were on the way. About the time she hung up, a man and woman got out of the truck. A MODOT truck rolled up, and a woman got out and directed traffic until the ambulance, the Sheriff, and a city police officer arrived. Somewhere along there I got out of my car, forcing the door open (as the quarter panel was shoved back into it) and looked at the carnage. The other guy’s truck showed significant damage in the middle of his big chrome bumper. My car? The engine compartment was compacted about halfway, and every fluid in the engine was leaking on the pavement. There was no fuel leak, though, which was naturally a good thing. A Scotland County ambulance arrived, as I said, and while I declined to be transported they did check me out and cleaned up the cuts on my left hand. There was a little glass in the cuts, which came out easily. I had called Tracy while I was looking over the car, and she took off immediately to come and get me. It’s about an hour’s drive from Highland High School where she works to where I was, so I told her I would meet her at the courthouse (where I was scheduled to be anyway, if you’ll recall). While the EMT was checking me out, a state trooper arrived, and when they were done with me and I had signed off that I did not want them to take me to the hospital, he talked to me about the incident. Mostly I just sat in his nice warm car while he wrote out the report, but when it was done and he had read it to me and I had approved the account of the accident, I moved on to the Sheriff’s truck for a little bit; for some reason I didn’t bother to ask about, rather than taking me to the courthouse, he contacted the city policeman (whose name I never got) to return and take me there. I had just enough time to get to the Recorder’s office and to tell my story (more or less as above) when Tracy arrived. I contacted my other customer in town and told them I would not be coming, as I was really beginning to hurt. Tracy called the VA in Kirksville (my usual health care provider) and was instructed to take me to the ER at Memphis. So that’s where I spent the remainder of my afternoon and part of the evening. The doctor and all the nurses and technicians I saw were very nice, and seemed to really know their business, but such a trip to the hospital is still a long old slog. Eventually, after a CAT scan and some X-Rays (and a nice dose of painkiller) I was told that I was okay and could go home. At this point, I’d like to thank everyone who helped me out today, the MODOT worker (or workers, I really don’t know how many were there) who directed traffic, the EMTs who took the first look at the damage to my body, the police officer and state trooper (neither of whom I can name at this point), the Scotland County Sheriff Wayne Winn, and the staff of the Scotland County Hospital Emergency Room. Everyone was very professional, and very good to me. Now for the cleanup. Sometime tomorrow we’ll have to go back up there and get all the inventory and other junk I keep in my car. 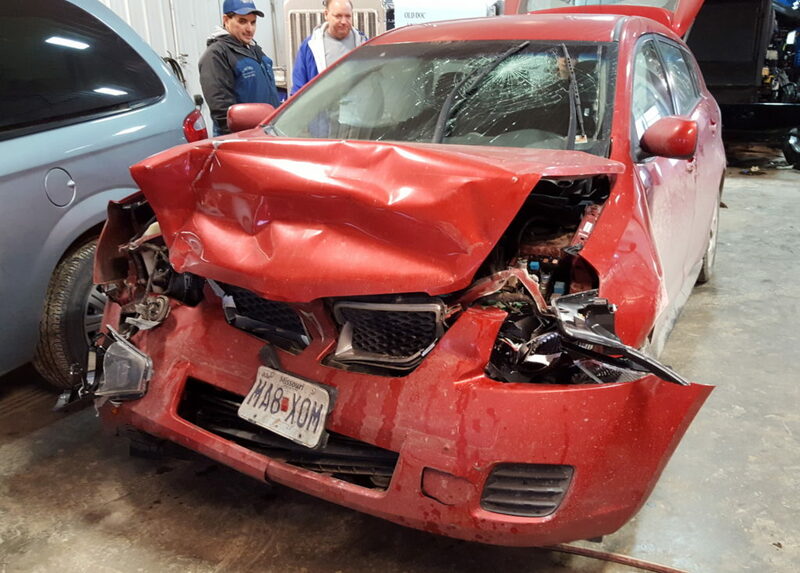 Then I’ll have to deal with the insurance, and sometime soon I’ll have to go car shopping… gah. I liked my Vibe. But as much as I liked driving it, I like even more the safety features that made what could have been a fatal accident into a merely painful one. And of course, to whoever was looking out for me today from the gloomy overcast above: Thank You!